Mae Fferm Ffactor yn ôl, ac am y tro cynta' erioed mae 'na dimau o selebs yn cystadlu mewn tasgau amaethyddol. 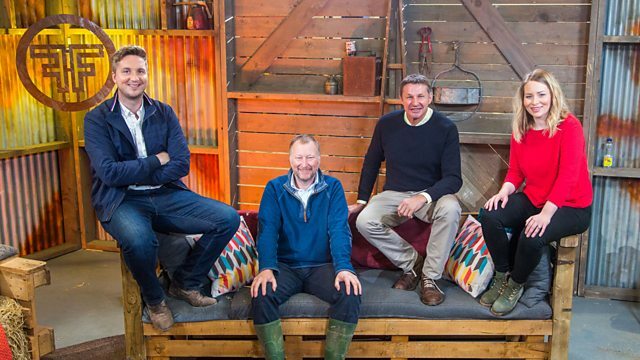 For first time ever teams of celebrities are let loose on the farm! Browse content similar to Pennod 1. Check below for episodes and series from the same categories and more! -scraping the bottom of the barrel. -They must need the cash. -later in the week. Ta-ra. -Right, ready to go? OK.
-Yes, Fferm Ffactor is back. -I'm a bit concerned about that. -..let alone driven a tractor. -Welcome to Fferm Ffactor - Selebs. -What could possibly go wrong? -and 3,000 for their chosen charity. -two giants of Welsh theatre. -wellingtons, jeans and a shirt. -but I don't have any skills. -I'm worried about the skill side. -not as good as us, you'll lose. -..but I'm not a farmer. -but not as a captain. -I have no experience with animals. -I'm not looking forward to this. -will proceed to the final. -and know-how to reach the top? -There's only one way to find out. -A warm welcome. Everyone OK? -The wellies are brand spankers. -A warm welcome to the studio. -I'll start with Ioan's team. -first impressions of Ioan Doyle? -The best, second to none. -Tell me about your team, Ioan. -with the team you have? -..having not revised for an exam. -But look! It's alright, isn't it? -You're in the farming world. -I'm looking forward to it. -Maybe not as confident as Cefin. -Alun and I have discussed it. -We hope Elen's a good leader. -You're in for a shock, boys! -No pressure, Elen, no pressure. -Alun, you've visited many farms. -and once to Gareth Wyn Jones' farm. -warm little bundle out of a hole. -Good luck to you, Elen's team. -I can't wait to see you in action. -Good luck to Ioan's team. -Ready for the first task? -Here's Caryl with an explanation. -There's a herd of pigs in the pen. -the course and into the trailer. -will watch the action with Ifan. -are this board and cane. -These pigs are determined creatures. -and patience to complete the task. -The team with the faster time wins. -Ioan's team and Elen's team. -Moving pigs is the first task. -kept one important detail from you. -The captain will stay here with me. -you'll herd the pigs, hopefully. -Good luck to you. Enjoy. -On we go with the pig task. -on them out in the yard. -but she can listen to them. -I told them not to scare them. -Who are you most worried about? -Alun thinks the pig will eat him. -Hey, pigs. Come on, pigs. -Come on, come on, pigs, come on. -I don't like it when they charge me. -Come on, Al, it's only a pig. -Oh, he's having a poo! -Do you know what these two need? -of this. The clock's ticking. -We need to change our tactics. -We don't want to hurt you. -We want to be friends. -to get the first pig out of the pen. -Who wants to follow this one? -Come on, come on, come on, come on. -There you go, there you go. -Open the gate, open the gate. -Look, this way, this way, this way. -Come on. They'll speed up now. -Hey, things are shaping up. -That way and around. Well done. -too far in front of them. -the fences, not through them! -to stop them turning back. -I think Alun's using the gate. -from the fence than his cane. -Look how close we are. -..the pigs will go in quicker. -Do you fancy picking it up? -Do you want to do it? -Oh, my gosh, well done. -Oh, my gosh, we've done it. -..in 21 minutes, 11 seconds. -Fair play. Happy with that. -to do and they led Nathan and Alun. -so fair play to them. -Don't rush, Lind, don't rush. -I told them not to rush. -Young pigs can be lively. -Cefin has a way with these pigs. -wouldn't have been faster than that. -amazing time - just over a minute. -leading the pigs to the trailer? -They're working well as a team. -They're great. Take it away, Cef! -One of them was bound to do that. -The pigs are enjoying this! -They're almost in the trailer. -How do they go up here? -Oh, come on. Come on. -Get them both in together. -That's it, go on. Go on, go on. -in the Royal Welsh Show soon! -and five points for their team. -about a man and his animal. -He has a rapport with pigs. -I hope Ioan will be proud too. -students how to deal with pigs. -How will Cefin fare with the ducks? -What's next? Ioan, talk to me! -on Fferm Ffactor - Selebs. -to the Fferm Ffactor studio. -are you ready for the next task? -task is this one - the excavator. -and returning them to the pen. -for hooking each yellow duck. -for hooking the golden duck. -It has a smaller ring on its head. -control the excavator. Good luck. -So there we are, teams. -two is ready to face the excavator? -where you'd have to lift things. -Is it similar to that? -Alun, it's your challenge. Happy? -I have two of them at home. -But it's not your challenge. -on the excavator or not? -but Cef would be better. -but I have stiff competition. -Good luck to both of you. -Let's move on to the task. -of training on the excavator. -and hook the ducks is Alun. -Nathan and Elen will be guiding him. -An impressive start from Alun. -until it's safely in the pen. -Tip the bucket. Up, up. -Good. Now tip the bucket. -Move it forward. Can you do that? -you've got this. Well done. -so he has a great chance. -Lovely. Carry on, carry on. -Alun's working like a pro. -You'd think he'd done this forever. -You obviously prefer ducks to pigs. -Almost got the golden duck. -still has five minutes remaining. -next - it's worth three points. -He didn't do it on purpose! -he can be happy with his effort. -Back to the yellow ducks. -No problems with that one. -Don't rip our pool, Alun! -I fancy a bath later. -a duck like that before. -I don't think he meant it, though. -than one way to hook a duck. -Three points for that one. -Grab the one in the far corner. -Right, good, whoa. Open it out. -how much of a buzz that gave me. -By the end, my head had gone. -I blame Elen Pencwm for that. -to absorb. I'm happy with that. -Don't set off like a nutter. -I think he has one now. -I've never seen this before. -What do I push first? -Easy does it with the controls. -They're all in the same corner. -through the rest of the task? -and pull it towards you. -One more hooked. Well done. -Watch out for those flies, Cef. -What do I do now? -Open the bucket. Right hand. -He's in the groove now. -an extension, Cefin's your man! -Left hand to the window. -Splash the water to move them out. -Cefin should follow his instincts. -the golden duck and three points. -He's filling his boots now. -Like water off a duck's back! -be a point behind Alun. -Keep swinging all the way around. -to bring the scores level. -As you do, turn the bucket. -What am I doing now? -hooking this many. Never, ever. -Does he have time for one more? -Brilliant job, Cef, well done. -I'm so proud of you. -Can I shake your hand? -Did you? Your smile says it all. -It's something different for us. -Any success we get is a bonus. -I want to jump in but I can't. -Well, Wyn, that was some task. -..and a gold duck each. -To get seven ducks each, excellent. -is shared between the teams. -points, Elen's team has 2.5 points. -Welcome back to Fferm Ffactor. -Are you enjoying yourselves so far? -You're all smiling and that's good. -The building challenge is next. -Here's Caryl to tell you more. -is build one using this equipment. -the team that works best together. -finished wheelbarrow on our course. -move the hay using the wheelbarrow. -the goat and lead it to the pen. -wins five points for the team. -What about this one, Elen? -how a wheelbarrow should work? -Have you ever pushed one? -We'll all be working as a team. -on how you work together. -is being part of a team. -Well, no, I'm not actually. -Fantastic. We're not saying anymore. -Have you built a wheelbarrow before? -You said he was a good captain. -Ioan's taking charge of the goat. -We have no doubts about this task. -How will you work as a team? -We have a good mix on the team. -I've made a giraffe before now. -That's just like a wheelbarrow. -that's worked together the best. -There's no time to argue. -It's stronger if it's like that. -That looks too big to me. -Let's see how big it is. -No, put it the other way. -Look. We can put it here. -Don't line that too much. -I can't get them out. -Elen's wheelbarrow is taking shape. -We'll stick it to something there. -It doesn't need to be under. -I'm holding the tape measure. -I understand what needs to be done. -The captain requested I do so. -We work as a team. -You're not doing much now. -It's not my fault, Captain. -It doesn't look straight to me. -as long as it works. -It looks easy but it's not. -wheelbarrow is really taking shape. -Yes, Alun, it is. You're right. -Do you want to take the bale out? -I need two more screws. -Ioan's discovered a small problem. -We're having trouble with the wheel. -before looking at the wheel. -for the body of the wheelbarrow. -the end of the task. -..but they've hit the buffers. -they worked well as a team. -I had high hopes for this one. -but they've got the hang of it. -that's saved them some time. -you need a wheelbarrow that works. -They've worked well as a team. -and it's up to the task. -Alun tries to hide some defects. -Alun, it's better to cut them off. -Stick it back on, stick it back on. -We've reached the end of the task. -It's fine. It's very solid. -It'll work well during the task. -they got on very well together. -but the wheel could cause problems. -when we see them out on the course. -Ioan was a strong leader. -in charge and led the other two. -the team who worked best together. -Where are those points going? -by the very slightest of margins. -you know what you have to do. -Three, two, one, away you go. -and scatter a fresh bale of hay. -at exactly the same time. -Close the gate. Quick, quick. -but Nathan's hot on his heels. -Ioan treats his goat with more care. -He only needs to close the gate. -for the second part of the task. -Ioan's team lead with 12.5 points. -Elen's team trail with 7.5 points. -of Fferm Ffactor - Selebs? -Have you enjoyed the tasks so far? -It's been a lot of fun. -There's one challenge to complete. -..and the industry in general. -One team member will ride the bull. -incorrectly, the bull speeds up. -Here we go, the final task. -who will ride the bull? -It could go one of two ways. -and it spins around slowly. -if you answer them all correctly. -Can you answer them correctly? -I'll ride the bull then. -No, no, I didn't say that! -Ioan and Linda answer the questions. -Nathan and I have no knowledge. -You'll have to answer the questions. -on the bull for as long as possible. -Elen and Alun answer the questions. -Let's move on to the final task. -Ifan, rotate the bull slowly. -of a semi-skimmed milk bottle? -What is a female pig called? -was the answer I wanted. -How many parts to a cow's stomach? -How long is a horse's pregnancy? -nine months or ten months? -come from which valley in Wales? -is used to bake bread? -Wheat, alfalfa or soy beans? -How many teeth do pigs have? -The correct answer is 44. -..are types of which vegetable? -The correct answer is carrot. -is used to make corned beef? -Brisket, front rib or sirloin? -Unlucky, Cefs. Still in one piece? -How will Elen's team fare? -Good luck, Nathan, hold on tight. -I should know this. Eleven months. -I'm turning it up one notch. -if it was a potato. -Sheep. Do sheep produce cheese? -so it could be right. Try goat. -Sheep is the correct answer. -in the shape of which letter? -V? Correct. Well done, Alun. -in the upper and lower mouth. -The upper or lower mouth? -The correct answer is lower mouth. -Ifan, increase the speed once more. -Which is the smallest horse breed? -remarkably well scoring 12 points. -Well, the challenges are over. -Welcome back to the studio. -of being on Fferm Ffactor? -make farmers out of these two. -as a team. I've enjoyed it. -It's been a remarkable experience. -It's a shame for you, but...! -far more exciting than I expected. -to make a right mess of it. -that I didn't make a mess of it! -..but the scores are important. -..nineteen and a half points. -..and a half points too. -nineteen and a half points. -Wyn and I have made a decision. -..Ioan's team wins it this time. -It was close, it really was. -You have no idea how close it was. -We'll see you in the final. -..but who will join them? -Find out next time on Fferm Ffactor.